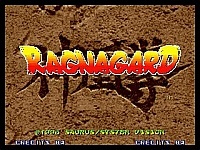 Ragnagard can sort of be compared to the game Killer Instinct at least graphically, because it is done in a similar pseudo 3D style with pre rendered fighters, but while the characters in K.I. are quite dark, the characters in this are more colourful and manga/anime styled. While Killer Instinct was a decent game for its time and is actually still reasonably playable today (and has many fans), this game is just not very good at all. There are many faults littered throughout it. The main problems that I had with it are that the controls just don't feel right and that the combatants are very unbalanced. Some fighters are much tougher than others, which makes for some very unfair fights. A good example of this was when on my first go, I chose Susano and got beaten on my second fight. 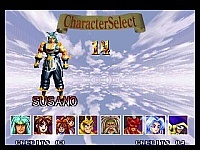 I then chose Seena and I actually got quite far through the game, but using very little skill. This was no fluke, because I tried playing with some of the other characters again and couldn't get very far, but then played as Seena again or even another guy called Syuten-Dozi I was able to get through the game fairly easily without dying. Maybe this means that I am crap with the other characters, but I have played against some of my friends and once again, the person who selects one of those two fighters usually seems to win. The two people I mentioned do seem to be either a lot stronger, or they have a greater reach than the others (just check out Seena's kicks). Apart from this, the game just isn't that much fun to play anyway... the fighting mechanics in even some of the oldest Neo Geo beat �em ups is far superior. The graphics are a mixed bag really. The characters and backgrounds do look fairly good, but are also very grainy. When the fights start up and the fighters are standing on the spot, the animation looks very smooth, but when you actually get into a fight it is not so good and can be very �choppy� at times. 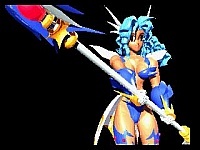 Having said that, I have seen much worse animation on some other games (Art of Fighting anyone?). The characters are interesting enough, but it is a shame they don't move as good as they look. There is one particular area that this game does excel in though. That is the soundtrack. 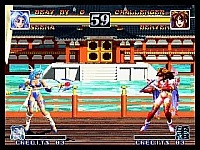 I personally think that this game has some of the very best music on the Neo Geo. Most of it is really great, especially on stages like Benten's, which have excellent background music. The sound effects and voices in the game aren't quite up to the same standard, but they do a good enough job even though some of the voices really do annoy you after you've been playing the game for a while.